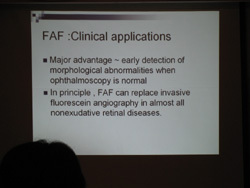 Seminar on Medical Retina by Dr. Nor Fariza Ngah. 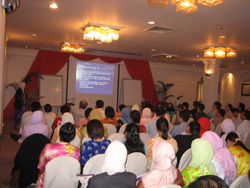 The Seminar on Medical Retina organized by the Eye Department of Sarawak General Hospital was held in Holiday Inn, Kuching last weekend (25-26/11/2006). 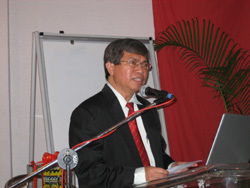 The speaker was Dr. Nor Fariza Ngah (Consultant Ophthalmologist) from the Uveitis and Medical Retina Services, Selayang Hospital. 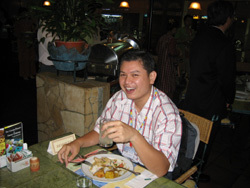 In the seminar, Dr. Nor Fariza Ngah shared with ophthalmologists in East Malaysia her valuable experience in managing various retina conditions including how to set up community based diabetic retinopathy screening programme. 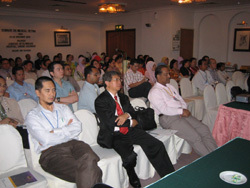 The course was well-attended by ophthalmologists from Sarawak and Sabah. 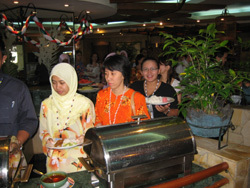 Dr. Intan, the head of the Eye Department, Sarawak General Hospital introduced Dr. Nor Fariza Ngah. 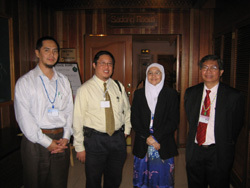 Dr. Mutalib, Dr. Mahadhir Alhady (Head of UNIMAS Eye Department), Dr. Nor Fariza Ngah and Dr. Intan. Dr. 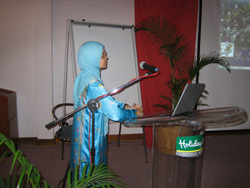 Nor Fariza Ngah presenting in the seminar. One of the many topics in the seminar. 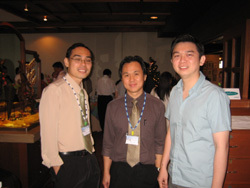 Some of the medical officers from Kuching and Kota Kinabalu. 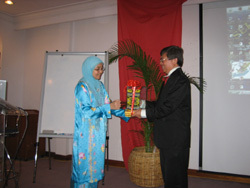 Dr. Intan presents a gift of appreciation to Dr. Nor Fariza Ngah.